Hello everyone - welcome to a new series on my blog called ‘top three’. 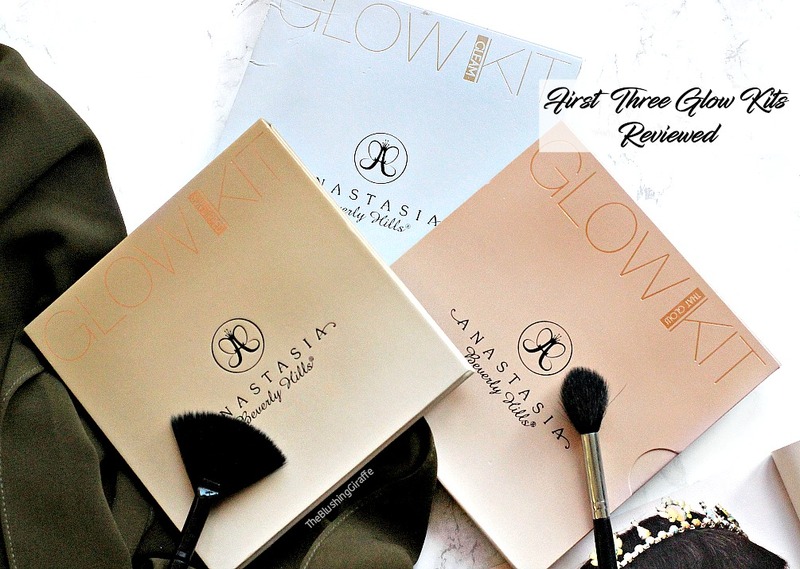 I love doing detailed reviews on here, those won’t stop, but I thought it would be useful to group together a lot of my favourite products and write about them! I aim for this to include makeup and skincare and for it to be seasonal too...I’m not so great at narrowing things down (you’ve probably noticed this from my favourites posts!) so this’ll be a challenge, but it’s one I look forwards too. 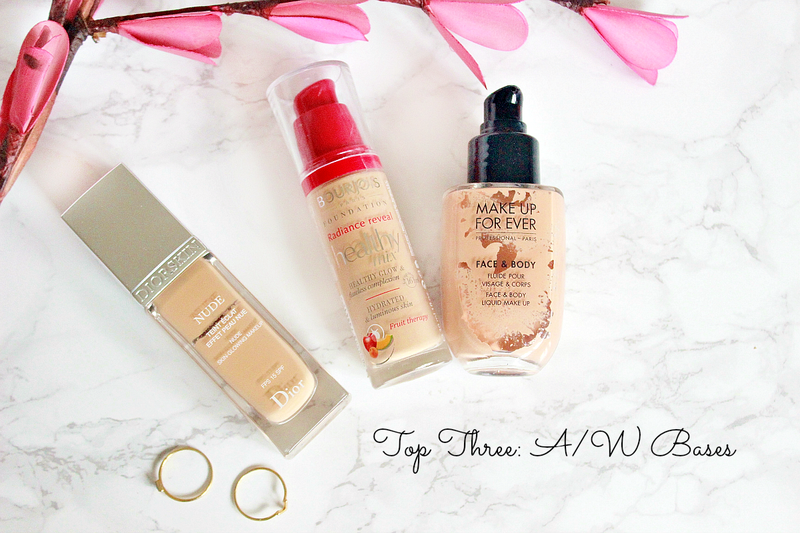 So to kick this series off I wanted to start with my top three daily bases from Autumn/Winter, the ones I’ll be reaching for most and why. This foundation has a semi-matte formula and it lasts well on the skin as long as you prep beforehand (for me using SPF works wonders!). It evens out my skintone effortlessly and provides a light to medium coverage. I like that it is buildable on discolouration or redness and the overall finish is perfect for day-to-day. Also this is one of the lightest (shade wise) bases that I own and so naturally it’ll match me best during the colder months. I’ve not spoken about this base on my blog yet and I really don’t know why. It’s a brilliant base from the drugstore, it provides a natural/healthy finish and has a medium and buildable coverage. I love that it feels lightweight on the skin too. One pump is enough for me and it blends so beautifully into the skin. With either a brush or a sponge (though coverage is more sheer) it takes a minute to get a lovely finish and the shade match is great for my winter skin. I find it lasts longer on the skin than their happy light foundation (which I also really like) and it doesn’t cling to any dry patches. Worth the price and so much more! Finally one of my HG bases, which is the trickiest to work with but once you get the hang of it, its beautiful. This base again provides a light/medium coverage and gives a dewy, glowy and healthy looking finish, whilst feeling light on the skin. As I have normal to dehydrated skin, the fact that this is water based works wonders. It’s the foundation I turn to most when my skin is looking dull due to colder weather and it needs a boost. I apply it with my fingers or with a buffing brush for an even finish. It does have buildable coverage so I find it is versatile too. Best part is that with a little bit of powder it lasts a long time on my skin - I love it! Honorary mention: Bourjois CC cream! It's amazing, I've reviewed it here and I think its fantastic for everyday - I just haven't been using it as much in the past few months so it MAY have slipping my mind! Those are my top three bases for this season and the next. All a little lighter in colour, but a variety of formulas and finishes, which are all great for day-to-day. What are your favourite foundations at the moment? Have you found your ultimate ‘HG’?